The HR-V Is Ready For An Adventure, Are You? With its roomy cabin for five passengers and its generous cargo capacity thanks to its class-exclusive 2nd-Row Magic Seat®, the 2019 HR-V is ready for an urban adventure around Chicago or weekend road trips out of the city. Plus, with high-tech convenience features like a touch-based automatic climate control system and standard Multi-Angle Rearview Camera, you can be prepared for whatever the weather, elements and traffic throw your way! How Much Interior Space Does the 2019 HR-V Provide? With over 100 cubic feet of passenger volume for up to five occupants, the 2019 HR-V provides the roomy feeling you want in a crossover. The 2019 HR-V impresses with its cargo-hauling abilities, too, thanks to 24.3 cubic feet of standard cargo capacity, and a maximum cargo volume of 58.8 cubic feet when the crossover's class-exclusive 2nd-Row Magic Seat is put into Utility Mode. With four distinct cargo-hauling modes, the HR-V's 2nd-Row Magic Seat allows you to haul long items or tall items with ease; or, use the second-row space as both seating and cargo space, thanks to the 60/40 split folding feature of the rear seats. Does the HR-V Get the Same High-Tech Safety Features as Other Honda Vehicles? Yes, the 2019 HR-V crossover comes equipped with smart safety features like Honda's Multi-Angle Rearview Camera, featuring three modes: normal, top-down and wide mode. Add in the available Honda LaneWatch system, and the center touchscreen display turns into a live video feed of the passenger-side blind spot when you initiate the right turn signal to change lanes, helping you see vehicles you may have missed. Test out these high-tech safety and convenience features at Muller Honda today; your 2019 Honda Fit is waiting! Beyond its advanced interior features, the 2019 HR-V boasts plenty of plush and upscale amenities that are sure to impress drivers and families. From heated front seats, automatic climate control and a push-button start system in the HR-V EX to leather-trimmed seating for five and a satellite-linked navigation system in the HR-V EX-L Navi model, Honda's small crossover is big on the features that count! Drive with confidence during those snowy Chicago winter days with the HR-V's available all-wheel drive (AWD) system. The Real Time AWD with Intelligent Control System can instantly transfer power to the rear wheels when the front wheels begin to slip, and continuously optimizes for fuel economy. 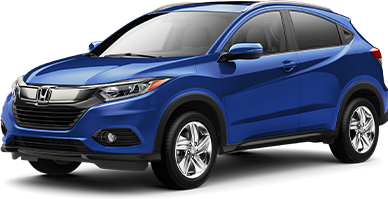 Test drive the versatile, fun and fuel-efficient 2018 Honda HR-V near Chicago and Skokie today at Muller Honda, located nearby in Highland Park, IL. Our Honda dealership and service center is home to an extensive selection of new Honda vehicles, including the entire range of 2018 HR-V trim levels, so stop by or start shopping our online inventory before your visit.